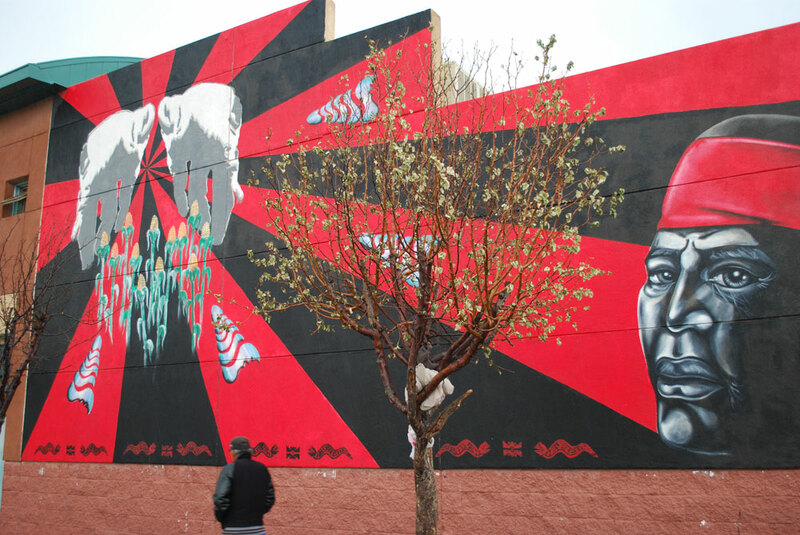 EL PASO – Local artists from El Paso and Ciudad Juarez have joined together in a network that spans the border, dedicated to painting the streets of both cities with hopeful art to refocus the minds of many who see this area as a war zone. The network known as Puro Borde, consists of more than two dozen artists from the El Paso-Juarez area who help each other exhibit their murals, turning their cities into more colorful communities. They also place their work in local galleries. Self-described “border artist” Arón Venegas, is a member of Puro Borde in El Paso who believes that art communicates with power. Venegas, a graduate of the University of Texas at El Paso, has worked on a variety of murals with Puro Borde and has exhibited his work in both Mexico and the U.S.
As for creating a sense of pride in a community through public art, Venegas suggests that a single mural cannot have the power that many with the same objective can. “Art that is not public is not worth doing,” Venegas said. In his opinion, art should serve the community. He explains that a mural is an interactive and collective process from beginning to end. Apparently there is not much sense of a divide between the artists from Juarez and those from El Paso. This entry was posted by cuevacha.